As we move the party from the fish courses into the meats, I like to start out with "lighter." Okay, so maybe stuffed quails served with a heavy egg based sauce doesn't sound like everyone's idea of "light", but stick with me here. The vegetables were sauteed, and then along with all of the other ingredients tossed in a bowl. The mass was then moistened with the re-hydrating liquid from the porchinis, and a bit of white wine, and chicken stock. The stuffing was prepared the previous day, but kept away from the quails. 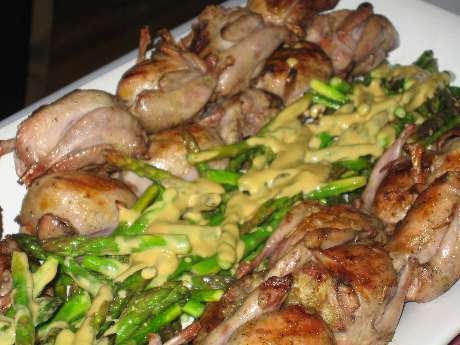 To stuff the quail, you place the stuffing within the quail body. The wings are then tucked to the sides, and a toothpick is run through the tips of the legs. This compresses the quail into a neat package for grilling, with the wings "caught" under the legs. You can see on the grill how well they kept under control. While the quail were resting and the toothpicks being removed, the fire was used to quickly heat the asparagas, which we placed on foil so that it would not fall between the grates. Again, using the fire we already had is a trick we like to make use of at the party. This way the stove was available for other uses. Sauce Foyot is a favorite of mine. Basically a lemon hollandaise with meat reduction added. I've written how to make it before so I won't go into all of the deails here. However, this sauce does appear to be one task that my kitchen help is more than happy to leave to me. It's okay, because I love making it, and it really only takes a few minutes to make once you have done it a few times. Oh yeah, the lemon zest in the stuffing? Ment to parallel the lemon in the sauce. I had one person comment "Is there lemon zest in the stuffing?" Pretty good palette there, John!